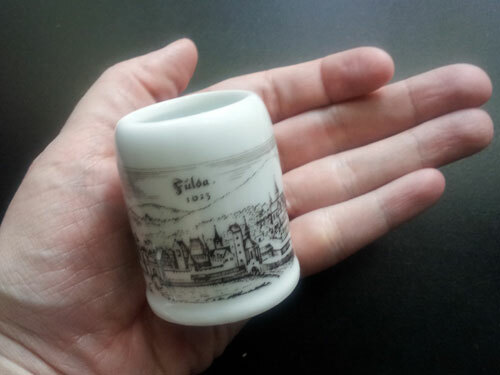 Yes, dear readers, my Fulda beer stein was approximately two and a half inches tall (which I would have realized if I’d read the description more carefully). I suppose I should have realized something was up when the seller offered free shipping. I couldn’t help laughing at myself over this, particularly because I’d listened to a story on This American Life less than two months earlier where the exact same thing happened. A couple who were shopping for furniture for their new house were ecstatic to win a bid on a dining room table, only to realize when it arrived that they’d bought a piece of dollhouse furniture. You can listen to the story here. You’d think that I would have looked at the listing more carefully after hearing that story, but the thought never entered my mind that a beer stein would be anything but normal size. 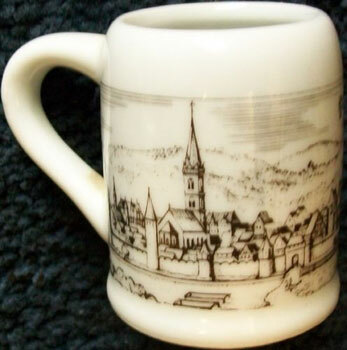 That said, I actually like this mini-stein. It’s rather cute. I’ve put it on the bookshelf next to my desk and get a kick out of seeing it every day. If the stein had been actual size I probably would have shoved it in my kitchen cabinet and only pulled it out once or twice a year. I think I’ll actually get more enjoyment out of it this way. Or perhaps I’m just rationalizing and telling myself things worked out for the best as all humans are prone to do no matter what stupid things happen to them. A wax rendering of the cathedral in Fulda, Germany, which also features the city’s coat of arms. 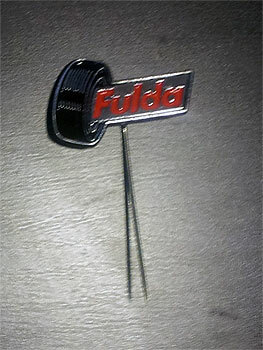 A pin featuring the logo of the Fulda tire company. I also had a patch with the Fulda tire logo on it that I attached to my carry-on suitcase, but unfortunately it fell off somewhere in transit. I still miss that patch 🙁 If anyone ever sees an ebay listing for that, let me know. I would buy it again even if it’s a strange size. 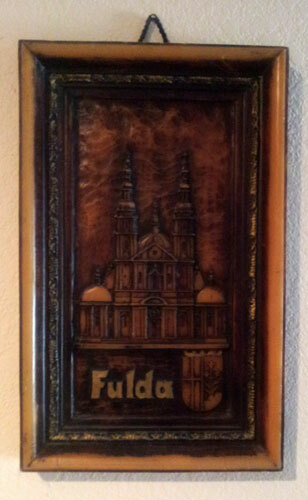 If you just type in Fulda on ebay, it is amazing how many things pop up. I had no idea. That stein is taking portion control too far, hehehe! Funny… I would like your version better, too. It’s nice to have things that make you smile when you see them. I was just listening to that TAL episode, and it made me think of you + your ministein! @Meg – I still feel silly that I didn’t catch the size factor even after listening to that episode!